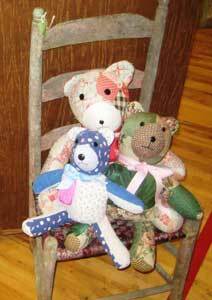 A teddy bear collection can be big or small and contain very large bears or very small ones. Whatever the size of the collection there are several things you may want to consider when displaying your bears, I hope to cover those issues here. Many of us do not have the luxury of living in a large house with lots of spare rooms and shelves to accommodate a large collection. Be realistic and make a decision as to just how much space you have in your home for a teddy bear hug (a group of bears). Try to keep to that decision as it is all too easy for your collecting to get out of hand and over take your home. Making life rather more difficult for other family members than was intended. If space is tight then you may want to consider early on only collecting small or miniature bears. These are a great option but of course it doesn't stop you having the occasional larger bear to keep them company. Most modern teddy bears are fairly robust and can withstand quite a lot of cuddling and kissing especially from the younger members of the family. But older bears may not be so tough and you will have to make sure that your bears are displayed out of reach of tiny hands and paws too. Light, dust and insect damage is also something to consider. Leaving your bears near a window for too long will fade the colour of the fur. Dust will also distort colour and turn your bear a rather nasty shade of gray over time. Insects too can harm soft toys if left to their own devices. The older the bear the more desirable they seem to be to small insects to make their homes in. If you are lucky enough to have a teddy bear collection containing bears with some value you will have to display them far more carefully than more modern bears. Special display cases built for purpose, perhaps with a lockable door may be your best option. Of course don't forget to give these bears the occasional hug too though. 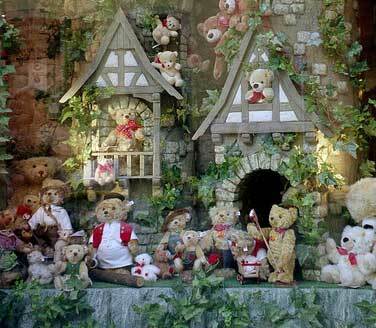 Many teddy bear collectors like to make up sets within their homes to display their bears. These can be changed regularly to freshen up the scene and is also a good excuse to dust off the bears at the same time. School room with chalk board and desks and chairs. Miniature bears can also look good displayed in a dolls house. Finding items to help display your bears is fairly easy. My advice is to keep your eyes peeled every day as you go about your normal work. I have found lots of great items and ideas this way. For more period pieces and specialised items of furniture antique shops and flea markets are good options. Take your time with these though as you may be inspired by some of the things on offer such as old shop fittings and display items. Dolls fairs are great for finding small items of furniture and standing doll stands, as well as items of clothing for your bear. A teddy bear collection can be anything you want, cost need not be a hindrance and with some imagination your collection can take pride of place in your home.